I know, a bulging disc in your lower back can be so painful. You most likely have a L5-S1 or L4-5 disc bulge or maybe a disc herniation at those levels. You are probably suffering some type of sciatica pain down your left leg, if you’re a guy, and your right leg, if your a women. Why do I say left for men and right for women? It’s because of all the people I have met over the years dealing with sciatica pain from a bulging disc. I have noticed with a man most of the time the left leg is the side of the painful pinched nerve while in women it’s the opposite. I have no idea why that is. This just happens to be a pattern I’ve picked up, but is definitely not a stead fast rule though. However, what I do know is how to help treat a bulging disc in your lower back. Here are some treatment options for you below. If you don’t already know what is a bulging disc or what I mean by L5-S1 disc herniation then you can read that first so you don’t get confused. I have already mentioned the three most common bulging disc treatment levels, but maybe lets look at 10 treatment options you can start at home right now. Ice – ice is a great natural anti-inflammatory and pain killer for muscle and joint pain in your back. What I would do is take a soft gel ice pack or a bag of frozen peas in dish cloth and place it on my lower back at the belt level. I would make sure there is a thin cloth between the ice pack and my skin so not to get freezer burn. I would leave the ice on my low back for 20min then wait an hour for it to freeze and repeat for 20min again. Doing this 20 ON 1 hour OFF as many times in a row as I want. Get an ice pack here . Lumbar Support Belt – when you can’t tighten your abdominal core muscle group because of a severe back muscle spasm then different recommended lumbar support belts (a.k.a kidney belt in weightlifting) can help act like your core muscles. I would wear one of those velcro strap around your waist belts during the day whilst moving or driving. Usually this type of back brace is only needed for a few days in a row to help acute pain episodes. So you hopefully don’t become dependant on it forever to support your spine. However, these are used to manage chronic pain and prevention of severe pain when working or lifting heavy weights. Low Back Cushion – if you are sitting with a low back pain it can be very uncomfortable. 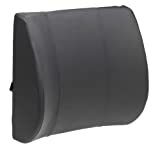 To solve this get one of the best lumbar support cushions for lower back pain. Use a portable lumbar seat cushion , or a small cushion, and place it in the small of your lower back. The cushion will act as a lumbar support like you get in car seats. The pillow helps create a natural arch in your lumbar spine to take excess pressure off it. Use this especially when driving. 90-90 position – this can be such a low back pain relieving position. In this 90-90 position you are placing very little pressure on the discs in your lower back. I would normally be icing my lumbar spine whilst get pain relief in this rest position. If you haven’t been sleeping properly because of the back pain you can get a power nap in the 90-90 position. Lazy Boy Chair – this is similar to the 90-90 position above but in a chair. These are your recliner arm chairs that you can control by a lever or a button. I have fallen asleep many a night in a lazy boy type chair watching TV when I had a back pain episode. What I like about this rest position is it is the most comfortable position to sleep in with low back pain. Laying flat in a bed or on your side is relaxing. It is also very sore getting out of bed in the morning. Try icing your lower back whilst resting in a back friendly recliner arm chair or sofa. Gluteal Muscles Squeezing – your gluteal muscles are your bum muscles. Trying to bend over a little even to brush your teeth or clean a dish can be excruciating. The way to prevent the extreme pain is to tighten both bum muscles together then bend. Contracting the gluteal muscles helps to wake up your core muscles and tightens your spine protecting it from abnormal movement. Bend Like a Golfer – you know how golfers bend over to pick up a tee or their ball out of the hole. That is how a low back pain sufferer can bend as well. When you bend you are pivoting on the one legs hip joint. So there is no bending forward in your lower back spine. All the movement will come from the hip socket. You can also use a crutch or hold onto something like golfers hold onto a club like their putter when bending like a golfer. Don’t Sit or Lay for Too Long – when your in so much pain all you want to do is lay down or rest all day. You will need to do some movement to activate muscles. Short distance walking is good to pump muscles that help to take swelling and inflammation away. Research shows laying on your back doesn’t make you get better quicker and keeps you away form work even longer which will make you depressed form the loss of income. Sitting is one of the worst position to put pressure on the bulging disc in your lower back. Avoid prolonged periods of sitting. McKenzie Extension Exercises – these are a set of low back extension exercises to take the pressure of the sciatic nerve in your leg. McKenzie is a physical therapist who found that if you arch your back whilst standing or laying on your stomach the pain in the leg could be lessened. It is a way pull the bulging or herniated lumbar disc back in and take the pressure of the pinched sciatic nerve. Inversion Table Therapy – an inversion table used gravity to traction your bottom vertebrae apart and takes the pressure off the L5-S1 and L4-5 discs. You would control the angle at which you hang upside down and do this everyday for some pain relief. Researchers in England found that people with lumbar disc bulges and herniation’s were less likely to need spinal surgery if they used an inversion therapy table like this one . Here is a list of common procedures used by doctors, physicians, and surgeons to alleviate lumbago type pain. Here you will find the top recommended lumbar spine braces to help support the lower spinal region and help protect bad movements on the Lx discs like L4, L5 and S1. When one of these intervertebral discs are herniating or bulging out then the spinal nerve root near it will become inflamed and can lead to pain in the buttock and down the leg called sciatica. The goal with one of the medical products below is to minimise this pain and disability issue and to allow you to carry on working be it sitting, lifting or doing an other activity of your choice. Mueller have made one of the most popular spinal belts in the world. This is a company that has been going since 1961. The founder was Curt Mueller was a registered pharmacist. He then took his understanding of the body and applied it into sports. Athletes for decades have been using M-Tape®, M-Wrap® and the MediKit™ athletic trainer’s kit. They have developed a support that is made for both men and women. It has adjustable velcro straps that can be made tighter to pull the tension in from the spine round the waist and to your stomach. This is to center the lumbar support over the area that needs it the most. Some unique features it has are: extra lumbar pad cushions that can be removed, breathable fabric for comfortable all-day usage, internal molded plastic parts to get rid of rolling or bunching of the belt, two tension straps to allow a custom-fit to your waist and of course is available in different sizes from small to XL sizes. The product is a 4.5 star rated product by over 3000 users on Amazon. Our recommendation is if you are looking for a trusted brand in the $20-$50 price range then get one of these on Amazon. Copper Compression LLC is a biotech company that hails out of Henderson, Nevada in the US. They manufacture a range of copper metal supporting products from chest under garments to arm and leg sleeves. There are two unique features of this product. The first unique feature is copper. They guarantee that their products have the most copper built in than any other competing brand. This one is made of 88% copper nylon and 12% spandex. The reason copper metal is woven into the fabric is for the same reasons why so many people around the world claim to feel better wearing a copper bracelet. You probably know of or at least heard of golfers who swear how good they feel when they wear their bracelet made of copper around their wrist. Maybe you wear one to and you are looking for a device to now use on your lower back too. The science is not 100% yet on the benefits of skin contact with copper, but metallic copper for sure has anti-microbial properties to kill yeasts, bacteria and viruses. The second unique feature of this support is the compression factor. Compression garments have been studied in sports science for performance and injury recovery. This research paper showed that yes compression clothing are effective for the recovery of exercise-induced muscle damage. It too is tightened around your waist with velcro straps. It can be used by both ladies and men with waist circumference of up to 50 inches. This is a 4-star user rated product over on Amazon. Our recommendation is if you are looking for up and coming brand in the $20-$50 price range then get one of these delivered from Amazon. Foxpro Sports Company out of Somerville, Massachusetts is company behind the product. This back belt caught our attention from the hundred of reviews and testimonials from Amazon buyers. This one also has the features you would require to provide lower back support. There are the velcro adjustable straps either side of your waist to loosen or fasten around your pelvis and waist according to comfort. The BraceUP belt has Mesh panels that are designed to release excess heat and moisture build up from use outdoors, or long term usage over a day. It has eight added vertical stays to increase a feeling of support over the posterior spine region and prevent excess movement when you are bending over. There are silicone straps built-in to help prevent slipping on your skin when moving up and down. It is light in weight so not to feel heavy on your hips all day. A sizing guide is to choose the Small/Medium for 28-35 inch waists, Large/Extra-Large for 35-43 inch waists and XXL for 43-53 inch waists. This is great for those who need a bigger brace compared to the other who are limited in how big they can go. Our recommendation is if you are looking for up and high rated product in the $19-$50 price range then get one of these delivered to you in the post via Amazon. Any of the above recommended products can be used for work, sport our chores around the house and garden. If you need to do some heavy lifting or moving heavy furniture these will help. Looking to do lots of manual jobs at the office, factory or warehouse and have a bad back at the moment? One of these can provide a feeling of support. Too many workers are developing and suffering workplace back injuries and pains. Some occupational injuries are accidents and others can be from repetitive strain movements and prolonged posture or postures required to do a job properly (standing, sitting). Using one of the corset type supports above will allow you to wear these under your clothes to keep your medical condition discrete and prevent unwanted attention if desired.